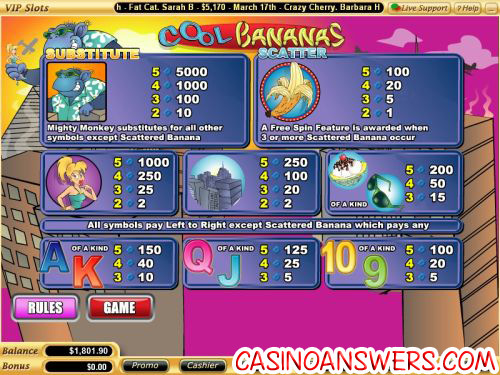 Cool Bananas Video Slot Guide & Review - Casino Answers! Cool Bananas is a 5-reel, 25-line video slot with a free spins feature and wild and scatter symbols. You can play Cool Bananas at Vegas Technology casinos such as Super Slots Casino, Cryptologic casinos such as Casino Joy and Random Logic casinos such as Supro Casino. For the purposes of this review, we will be reviewing the Vegas Technology version, incase there are any variations between the different platforms. Cool Bananas is a video slot with a monkey theme. The main character is a giant monkey called Mighty Monkey. Might Monkey acts like a tourist, complete with sunglasses and flowered shirt. He even grabs a blonde woman and climbs up ontop of a building, much like the movie monkey King Kong. Symbols in Cool Bananas are Mighty Monkey (wild substitute), Scattered Banana, Mighty Monkey’s blonde love interest, buildings, a cherry-topped sundae and a pair of sunglasses. There are also A, K, Q, J, 10 and 9 symbols to bolster the symbol count. All symbols pay left to right except the Scattered Banana, which pays any. The Mighty Monkey symbol is the top fixed jackpot. If you hit five Mighty Monkeys on an active payline, you will win 5000X your bet. The Mighty Monkey symbol is the wild symbol and will substitute for all other symbols except the Scattered Banana symbol. Cool Banana’s scatter symbol is the banana symbol. If three or more of these Scattered Banana symbols appear on a spin, you will win 8 free spins with a 2X multiplier. This means that during the free spins feature, all of your wins will be doubled. The free spins feature can be re-triggered. Your free spins will be played on the same lines and bet as the triggering spin. Upon the completion of the free spins feature, your wins will be added to the payline and scatter wins. Click the “Autoplay” button on the Cool Bananas video slot to launch the autoplay feature. You will be given the options to choose your spin settings, the number of spins you wish to play (from 5 to 500) and the number of seconds between each spin (from a quarter of a second to 2 seconds). Then you can choose your stop settings. The default option is to stop once all of your autoplay spins are completed, but you can also choose to stop once the jackpot is won, to stop if a win exceeds or equals (from $50 to $250), to stop on any win you receive or to stop if your credits increase or decrease by an amount you can choose (from $50 to $250). You can stop the autoplay feature at any time by hitting the “Cancel Autoplay” button where the “Autoplay” button was. Cool Bananas may not have the most features you can find in a video slot, but it is still a lot of fun to play. If you’re not interested in features like bonus games and progressive jackpots and just want a more run-of-the-mill video slot, we think you will like Cool Bananas. It helps that you can find Cool Bananas on a wide-range of casino platforms, at casinos such as the US-friendly Super Slots Casino and non-US casinos Casino Joy and Supro Casino. If want to know the best casino to play the Cool Bananas video slot at, we recommend you go for the 100% up to $2,000 signup bonus at Super Slots Casino. Where can USA casino players find Cool Bananas? US-based players can play Cool Bananas at Super Slots Casino, where they can get a 100% up to $500 bonus on each of their first four deposits. Do I need to download any software to play Cool Bananas? 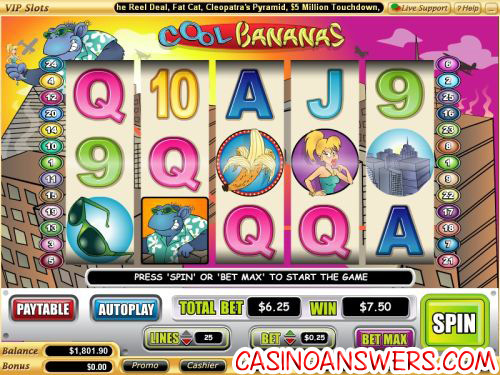 Cool Bananas is one of the many games offered on the Flash version of Super Slots Casino. If you don’t have Flash installed on your computer, you can download the newest version of Adobe Flash Player. What video slots have free spins? What slot machines are fun for kids?